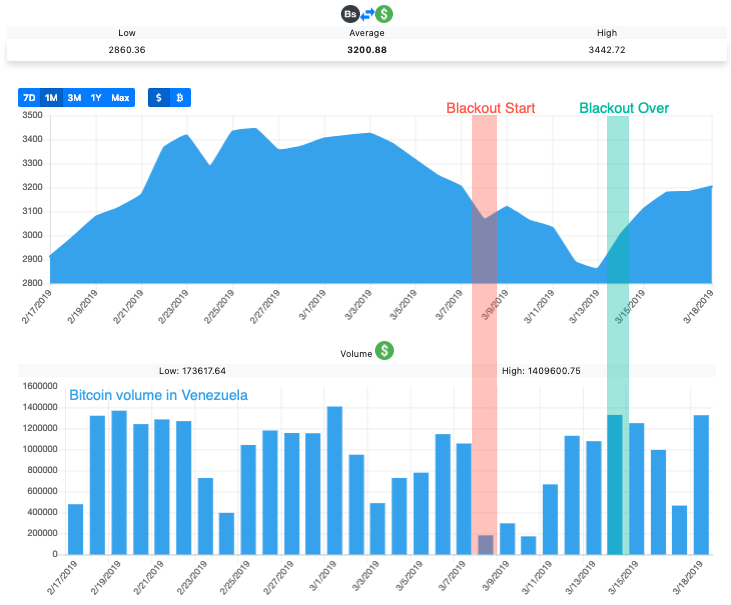 Bitcoin transactions in Venezuela collapsed earlier this month due to widespread electrical blackouts that paralyzed most of the country's 23 states. A widespread rolling blackout in Venezuela began on March 7 and ended around March 14. 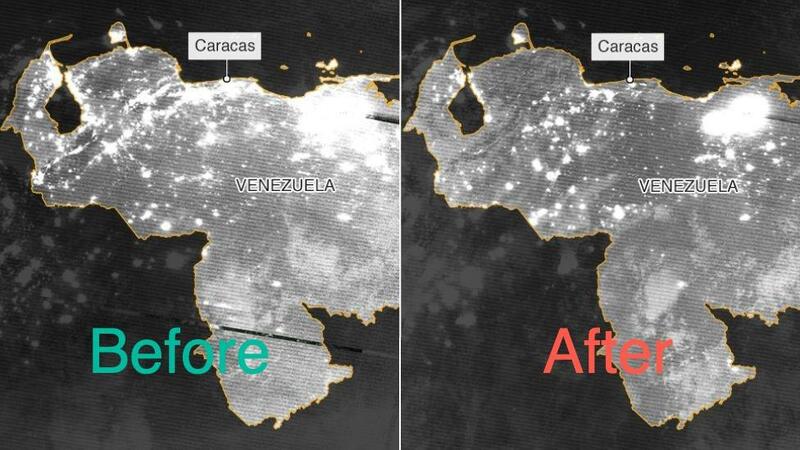 Some power was restored a few days later, but in Caracas and western regions near the border with Colombia - remained dark. By March 14, power across the country was back online. During the massive power outage, weekly trade volumes on the P2P platform Localbitcoins showed that the number of transactions collapsed by as much as 40% in the week ending March 9. By March 13, transaction volumes started to form a v-shape recovery as power was slowly turned on. 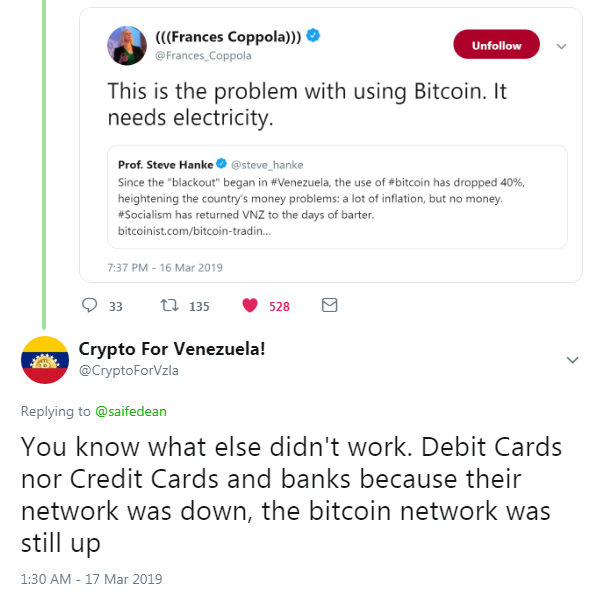 Frances Coppola, a business writer for Forbes, tweeted on March 16, two days after power was restored, that the issue with Bitcoin is that electricity is needed to transact. Twitter account Crypto For Venezuela!, tweeted at the Forbes writer by saying - during the blackout, financial institutions stopped functioning while some Bitcoin networks remained live. Anthony Pompliano, the founder of Morgan Creek Digital Assets, also responded to Coppola's tweet and pointed out how the cryptocurrency's network was still functional during the blackout. While this is true, only Venezuelans with access to power and internet access could transact. A Venezuelan Redditor, with the handle ImViTo, explained how the entire banking sector came to a halt during the blackouts. ImViTos said, some crypto enthusiasts around the country used generators and were still able to tap into phone lines to then broadcast WiFi to a small geographic area where people could transact digital coins on their smartphones. Energy-intensive Bitcoin transactions cannot withstand widespread power outages. In the case of Venezuela, data showed Zerohedge readers that transaction volume crashed when the power went out, but for some, who had generators and access to the internet - it was business as usual. Perhaps a future case study will be written on this event.